Having filmed on miniDV for so long, the splitting of the files on my memory card is my biggest complaint about my new Canon XA-10. To me, it makes logging any kind of edits-to-be-made during filming difficult. With miniDV, it was easy to write on a piece of paper: "edit @ 0:14:36" but with this memory card recording you can't exactly do that anymore. In addition to the splitting of the files when they reach a certain size, each time you press the pause button during the shoot, a new file is written to the memory card and the next time you start recording, the timer on the camera starts at 0:00 again. Whereas with the tape, I could drop the entire event onto the timeline and go to each time spot I recorded in my log and make the quick edits, whatever they needed to be. 27 minutes on the tape was at 27 minutes on the NLE timeline in other words... Does it make sense? Has anyone come up with a solution for logging such edits to make post production easier when shooting AVCHD on a memory card? With other cameras in the professional range like the XF100 or Sony NX5U they have full time code and you could do what you did with tape. If you keep the camera clock accurate and log against the real time you may have a work around as the files all record the actual time in the metadata. Not sure what editor you use but most allow you to see this realtime in some way. Although in all cases the likely approach is to put all on the timeline anyway. Thanks for the reply -I have Sony Vegas Pro. Did a quick search in the help file for metadata and found this"
You can use the Media Manager window to search for media and manage your collection of audio and video media so you can find just the right media for your Vegas Pro projects. The Media Manager maintains a database of your media, including file attributes, ACID metadata, and tags that you can assign to classify your media." I'm not sure if this is what you were referring to? I know that the file names the camera generates, for example, 20120923202813.mts means 2012/09/23 20:28:13 but the question still stands, even if I write down on my paper log that an edit needs to be made at a specific time when I look at my watch, how do I know where that time will be on the NLE timeline? Although I have Vegas Pro 11 and CS6 my main editor is Edius. 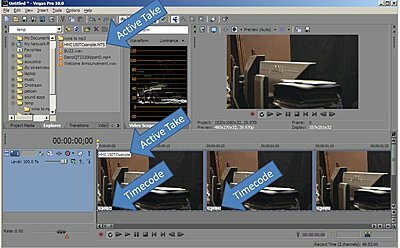 .Not sure how to show in Vegas or CS6 but in Edius , in clip properties, one can see a small window of the clip and scroll through the clip which then will show both the original date and time position and the timeline time starting from 0. So if you know the realtime you could find the corresponding timeline clip time. Can of course also show date and time as an overlay in the preview monitor or on the final output. Ron mentioned in passing that some AVCHD camcorders will allow "free run" of timecode. 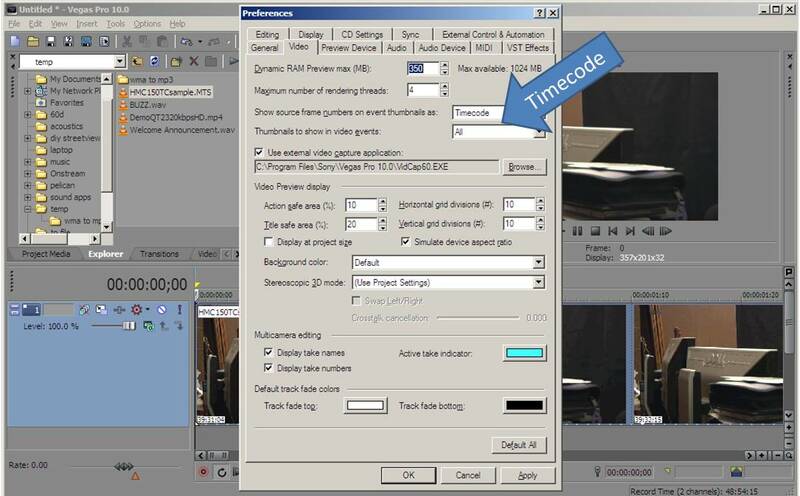 In combination with using preset, this will allow the use of "time-of-day timecode". That is, the camera's timecode generator just runs and runs, whether you're recording or not. For example, I've got a Panasonic AG-HMC150P in the shop at the moment, it does this rather well. Anyone logging can use their watch as a timecode reference! (be careful with the camera's timecode preset, synchronize watches, etc.) You don't want to try this for the first time on-set, as using TOD code can be a little finicky to set up. This will show timecode as a tooltip-style overlay directly on timeline clips... zoom in and it will show frame by frame, if that's what you want! Vegas is great for this sort of stuff. I haven't explored the trimmer's capabilities for timecode display because I'm usually syncing multiple sources when I use it, but on the timeline it works great! Ahhhhhhhhhhh finally the answer from Seth! Funny I had to find a "Vegas user since 1.0" to get the answer. Showing the timecode on the thumbnails is exactly what I needed. I can now log an edit to be made at 5:06 and when I look at the clip on the timeline, I can go right to 5:06 no matter where the event is on the timeline - Thank you! Just tried that with AVCHD files from both my NX5U ( with true timecode) and the CX700 with just date and time. Neither shows correctly in Vegas 11. They just show the timeline time even though I have selected source in the preference. ie all time starts at 0 on the timeline and either counts in frames time or timecode. Vegas doesn't seem to take it from the source file. What am I doing wrong? I also still have Vegas 10 installed and its the same there too. 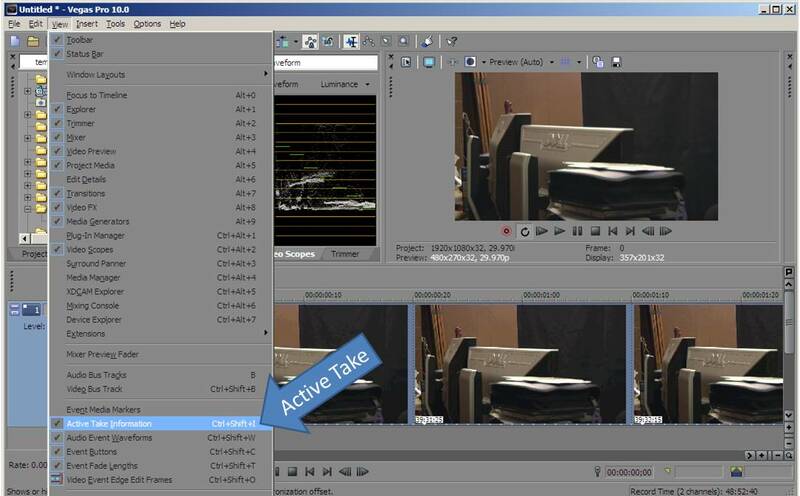 There is an overlay VideoFX but that too only shows the timeline in different formats not the source file embedded time. I am being to think that Vegas cannot use the embedded time. If we're talking about the same thing, then mine is working ok, I enabled the options in the preferences as instructed and it now shows the timecode of the event on the bottom right of the thumbnails on the timeline, as it was filmed in the camera. Ron, there are the camera settings for free-run timecode, AND the Vegas settings to display it. Both must be working for this. As an example I shot a show the other evening that started at 7pm so my timecode on all cameras started at 0 then( I had reset the NX5U timecode to 0 to start). So all the files from the cameras start at 0 when placed on the timeline. For ACT 2. The timecode on the NX5U carries on just like a tape camera would so starts at 45min, which Vegas shows correctly but I cannot find a way of Vegas showing the real time of 8pm for ACT 2 start etc which is there in all the files from all the cameras and which I can display in Edius as another guide as well as the timecode. The CX700, XR500 and SR11 are just like your XA10. Counter is reset to 0 when the camera is stopped. When I selected TIME in the preferences I expected Vegas to show the real clock time. It doesn't just another format for timecode. If you are happy with writing down the counter position then that will work but you will also need to know the clip for that too. I was trying to give you an option for relating to the actual time on your watch which you could use in Edius to get close. If you log by clip you will need both clip number and counter position. Yes Seth that is how I have it set up and see the same but it was not what I was after. It was the real clock time ( and date ) I wanted displayed. Ah, that's not "timecode", I'm afraid, and Vegas doesn't display it. However, you might be able to set up your cam for time-of-day timecode, and at least get the "clock" part of what you want. Camera clock / date has been discussed a few times on the Vegas forums; you'd have to use a different NLE or perhaps a utility to display it. If your camera manufacturer has a player for your cam, it might display it. But not Vegas, not since the manufacturers decided that HDV would be open to different implementations, and it only got worse with MPEG2 and MPEG4/AVCHD camcorders. I was just trying to find a work around for Mike to get around the fact that every time XA10 stops it starts a new counter position for the timecode unlike tape which just goes on until counter is reset. The camera clock does not reset but keeps on going and gives the opportunity to fix an absolute position if the camera, like the XA10 does not have "rec run" or "free run" timecode but just a timecode counter. The camera clock is the closest to free run. I have several NLE's for a reason. Edius I find the best for video, Vegas I really use as a multitrack audio editor and which I have used since it was just an audio editor. I really have CS6 for Photoshop, Encore and AE as I don't really use Premiere.